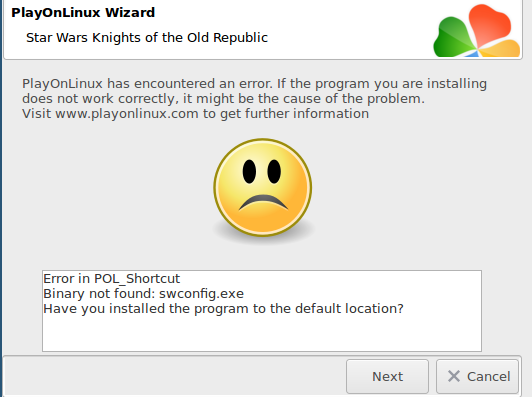 Star Wars: Knights Of The Old Republic - Unterstützte Software - PlayOnLinux - Run your Windows applications on Linux easily! TITLE="Star Wars Knights of the Old Republic"
LNG_INSERT_MEDIA_3="Veuillez insérer le disque 3 dans votre lecteur\nsi ce n'est pas déja fait." LNG_INSERT_MEDIA_4="Veuillez insérer le disque 4 dans votre lecteur\nsi ce n'est pas déja fait." LNG_WAIT_STEAM_END="Appuyez sur \"Suivant\" UNIQUEMENT quand l'installation de Steam et du jeu\nsera terminée sous peine de devoir recommencer l'installation." LNG_INSERT_MEDIA_3="Please insert disk 3 into your disk drive\nif not already done." LNG_INSERT_MEDIA_4="Please insert disk 4 into your disk drive\nif not already done." LNG_WAIT_STEAM_END="Click on \"Forward\" ONLY when Steam and the game installation\swill be finished or you will have to redo the installation." POL_SetupWindow_presentation "$TITLE" "LucasArts" "www.bioware.com/games/knights_old_republic" "GNU_Raziel" "$PREFIX"
POL_SetupWindow_menu "$LNG_CHOOSE_MEDIA" "$TITLE" "$LNG_CD~$LNG_DVD~$LNG_STEAM~$LNG_DDV" "~"
POL_SetupWindow_auto_shortcut "$PREFIX" "swkotor.exe" "$TITLE" "$PREFIX.xpm" ""
POL_SetupWindow_auto_shortcut "$PREFIX" "swconfig.exe" "$GAME_CONFIG" "$PREFIX.xpm" ""
If you run the game directly from the .exe, it starts on fullscreen and it shows the cursor (only if it was previously activated on the config). However, every once in a while the game crashes (especially on loading screens).